It has been over a week since I took OOTToddler over the river and through the woods, to Grandmother’s house via train. After a week of recovery, I think I am finally able to speak about it. I was looking forward to seeing our family in MD, as it had been since Christmas that we’d been there, and my mother and father were anxiously waiting to see us. I had never taken a train before so was a bit daunted by the process of traveling with a toddler. The logistics of carrying our stuff and chasing a toddler was weighing heavily, but I thought that I could at least pick up some tips to pass on to you. I was wrong. So so terribly wrong. The portion of the trip on the train that went to New York City was awful. Toddler thought she could run freely among the passengers, but then would cry when they looked at her. (Shy girl!) I couldn’t get my phone to connect to the train’s wifi, so I had to use 3G to connect to her most favorite cartoon, Caillou. That was slow and when it began to buffer, she would totally lose interest and start running a muck through the train again. I wrangled and wrestled her until I could get her settled and Caillou reloaded. By the time we pulled into NYC, I was exhausted, frustrated, and wondering what I’d gotten myself into. We had an hour stop before the next train, so we ventured out into the city. That was fun and Toddler seemed to enjoy seeing the people (and them not paying attention to her). We stopped for breakfast, and the problem was getting breakfast, holding a wiggly toddler, guiding Toddler, a suitcase, and a high chair to a table in a crowded fast food place. Then to my surprise, an elderly gentleman offered to help. He pushed the high chair and guided Toddler (who held his hand like she’d known him forever!) to an empty table. Once we’d had breakfast, she and I headed back to the train station. I was then balancing all the items before, along with a hot coffee I knew I needed for the trip. I was spilling it everywhere as I tried to pull the suitcase with the hand I was also holding coffee in. As I was building up Toddler to go on the escalator to the floor we needed, (“Walk, walk, walk, walk!” ) 2 soldiers watching my struggles pointed me to the elevator. Who says people in NYC are rude? The same cannot be said for the people in Wilmington, DE. The second portion of the trip went swimingly. 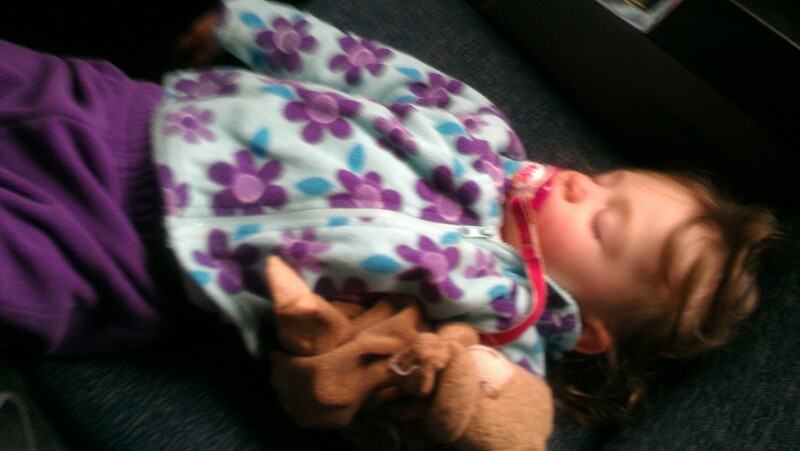 Toddler took a nap most of the way, and I had to wake her once we got to our destination in DE. Gathering my stuff and a sleepy child, we were trapped by the people boarding the train, and a young man nearly knocked us over as we tried to get down the aisle. “What I gentleman,” I snarked. He apologized abruptly, and we got to the exit of the train. I put toddler on the platform and went to pull the suitcase over the gap between the platform and the train, when a train employee was like “stop!”. I realized in that moment, I should have dumped the suitcase first, then the toddler. What if she’d fallen, or been left alone on the platform while I was pulling away on the train because that jerk blocked our way out? Tip: drop the suitcase first on the platform, then ferry the toddler over. Disaster averted, but only because I had time. Lesson learned and that didn’t /won’t happen again. The Fresh Prince and his lovely lady! The vacation was spent catching up with family and friends, and drinking wine. 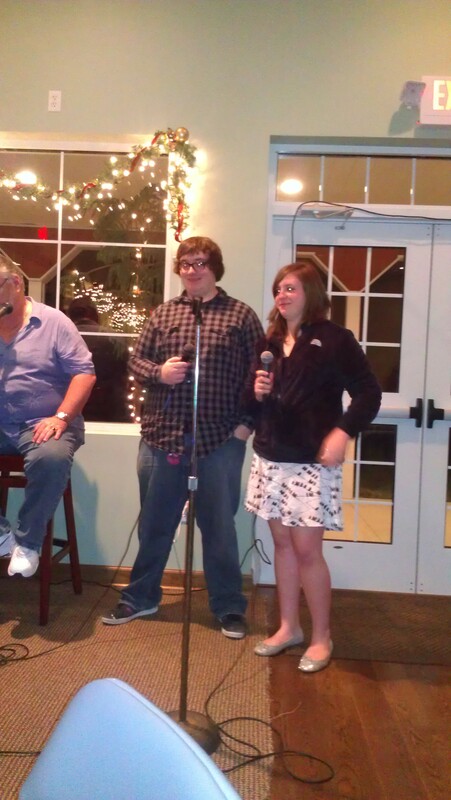 There was also some karaoke involved, and Out of Time Teen and Out of Time Teen’s Girlfriend did a crowd inspiring version of “The Fresh Prince of Bel Air” theme song. Fun was had by all, though the closer I got to the trip back home, the more dread fell upon me. Surprisingly the first half of the train trip went pretty well. Caillou was rolling on the netflix and Toddler watched it quietly in the seat next to me. When we stopped in NYC to switch trains, we had time for a slice of pizza. (NYC pizza is the best!) The second half of the trip seemed like it would go just as smoothly, until Toddler refused to watch Caillou and wanted to just bury her face in my neck and proceeded to try to climb into me. She was hot and crying and continued that way for 45 minutes. The other passengers on the train probably wanted to jump off. A kind gentleman brought me a cup of water, and I tried to offer it to Toddler, but I couldn’t get her face out of my neck long enough to drink it. I called OoTDad and asked him to make sure we had medication available at home for a fever. A woman on the train came over and asked if my baby was sick. I’m not sure if she wanted to quarantine us or offer some comfort, but after I told her I thought she had a fever, she nodded and beat feet back to her seat. When we finally arrived at the station, I grabbed our stuff, and the feverish little one and got off the train. Fortunately it was the last stop and I didn’t have to rush her outside. Of course, it was 15 degrees out when we got off the train, and I parked in the cheapest, furthest lot away. Toddler kept saying “Cold, cold!” and I wanted to nuzzle her inside my coat and run to the car, but I was carrying a lot of stuff, and I just couldn’t leave it behind. I was relieved to get to the car and put Toddler in out of the cold. 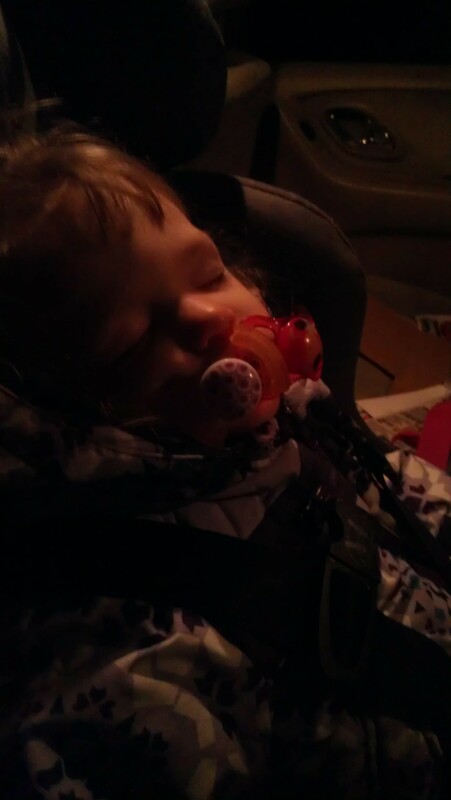 I gave her a binky and her bear, and we headed toward home. When she started crying out, “Binky! Binky!” I searched my purse for a spare and not being able to find one, I pulled over and went to the back seat to look for the one I thought she’d dropped. A day so bad, she needed 2 binkies! A day so bad, Mama needed the next day off to recover! I’m sorry I don’t have more than one tip to offer, but if you have any to offer me, I might be willing to take the train again. Until then, I’ll be leaving the driving to…. ME!